Currently in print (as an ebook). 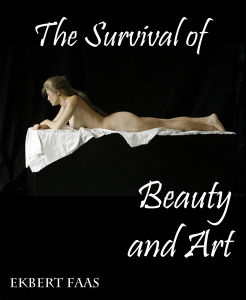 The Survival of Beauty and Art develops an unprecedented theory of aesthetics and art, based on up-to-date evolutionary and cognitive science. Rather than restricting its subject to one–line formulas like “art = significant form” or “art is or is not adaptive,” like traditional or evolutionary aesthetics, Survival casts its net as wide as possible. Art is embedded in what is called “the artefactual,” i.e., things (like beehives and churches) created by some of nature’s organisms, rather than by nature itself; aesthetics is rooted in primordial susceptibilities like those of unicellular amoebas at the dawn of life, going in pursuit of what is nutritive or trying to avoid what is aversive. In their over three billion years of evolutionary development, these primitive, or what’s here called affective, aesthetic impulses were enriched by sexual, perceptual, cognitive, and finally cultural ones. From its first chapter, Survival attempts to show how artworks, instead of removing themselves into ever more rarefied spheres of the cognitive and cultural, for the most part continue to draw on the affective, sexual and perceptual. In turn, Survival focuses on each of these five major categories by invoking intriguing facts, colourful anecdotes, even just-so stories rather than by disentangling each and every scholarly conundrum. Wherever appropriate, it fleshes out theories by interpreting individual artworks, backed up by illustrations. In this, Faas draws not just on evolutionary and neuroscientific insights, but on the full arsenal (familiar to him from multiple previous publications) of older interpretive, iconographic, psychological and art historical approaches. Thus, his new theory of aesthetics/art, although firmly rooted in the life sciences, fully incorporates whatever can be salvaged from traditional humanities disciplines. Hence, Survival should be of interest to readers looking for the unprecedented and unfamiliar as well as to those continuing to cherish the old. The Survival of Beauty and Art will probably meet with similarly divided responses. The study continues its polemics against traditional (formalist) aestheticians, especially by focusing on more recent ones (like Arthur C. Danto’s) with their Hegel/Heidegger-inspired prophecies about the imminent death of art. However, Faas also critiques the Darwinists’ obsession with trying to prove that art/aesthetics is, say, either an adaptation in its own right or merely a byproduct of more genuine adaptations, like the play instinct. Just to say that it was great meeting you the other night in Toronto. Hope our paths would collide again. Keep up the good work! Hi, Professor Ekbert Faas, I have read your book The Genealogy of Aesthetics, and I am very happy to see your new book The Survival of Beauty and Art. Could you tell me your email address? I have not found it yet. Thank you very much. Thank you. My email address is faas@ekbertfaas.net.